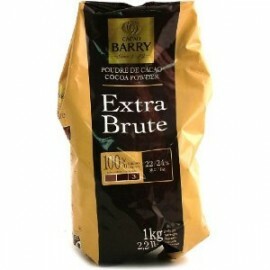 Cacao Barry Callebaut Extra Brute Cocoa Powder is a cocoa powder that is alkalized processed for a uniquely balanced colour, taste and consistency. *Luminous and intense red, very flavourful. For covering truffles or a copper-coloured powdering. This rich cocoa powder displays an intense, glowing red colour and provides a deep chocolate flavour. A favourite of bakers. *Applications: Ideal product for mousses, creams, biscuits, ice-creams, sorbets, confectionery coverings, decoration, hot chocolates. Experiment as a covering for truffles or as powdering for desserts to add a fine copper colour. excellent for those upcoming special Xmas treats!